It’s time for the sequel to Willard. As you can probably guess, this won’t really end well for the film. The first one had just about everything that you wouldn’t want to see in a film. While this film shows some marginal improvement with a better cast, it’s still so bad that it doesn’t really make a difference. There still aren’t any real positives to speak of so the film can’t really gain any ground. Furthermore, the concept was never good to begin with so it’s not like the film could fall back on its potential. So, Ben escaped from the proper authorities last time. Now he is back and he has brought an army. The plan is for Ben and his friends to decimate the city and put all of the local grocery/supermarkets out of business. This plan hits a snag when Danny shows up. He’s a nice kid who always wanted to sing, but simply doesn’t have the talent. He has some kind of condition with his heart so it’s hard for him to breath or move all that much. Ben takes pity on him and decides to become friends, but he still has to defend himself from the cops. The cops suspect that something is up, but are too busy with their banter to give it too much extra thought at the moment. At the very least, it’s nice to see the cops get more of a role. They talk and act with complete seriousness so you know that the threat is real. They arm themselves to the teeth with flame throwers, guns, sticks, and all sorts of weapons. These guys definitely didn’t come to play, they came to win! It’s all part of the plan, but alas it is not that easy. The Rats are smarter than they look and somehow can still compete. It’s almost funny when one guy runs out of the tunnel and informs the chief that they’re losing. By this point there are at least a dozen guys who ran into the sewers with their flame throwers and they’re still losing? I don’t know what to say about that. Once you have a fire weapon, the rats should not be able to break the line. Maybe the guys started to space out or something. The rats definitely get a lot of hype so the humans are on the defensive for quite a while. At least they still manage to keep secrets from each other so none of them are on the same page. One of them even rubs in the fact that if the rats were a little bigger things would be dicier. Clearly these guys needed more grenades and such. While the climax is a lot more explosive and intense than the first one, it’s still built around animal violence so it’s no better. As a whole the film was certainly less violent than the first one so that’s nice. It’s still violent enough to issue some warning bells though. Danny also doesn’t work well as a main character. First off, he’s pretty annoying like just about any other kid in a movie. Second, giving him the heart problem just felt like an excuse for some drama and it never added anything into the film. That subplot never should have made it past production. The sister’s insistence on Danny having an imaginary friend was also pretty dicey the whole time since he made it clear that it was real from the start. At first you just assume that she’s covering for him, but she actually ended up believing it. It was awful convenient for the kid that’s for sure. As for Ben, he is now a family man which is an interesting twist. That being said, he’s not a particularly good one since he ditches his family every day to hang out with Danny. This plot point also felt out of place since it’s completely out of character and makes no sense. I believe the writers felt like it was the only way they could get Danny into the story, but then maybe they shouldn’t have gotten him involved at all. The rest of the film actually wouldn’t change at all and it would have helped a bit. Shorten the run time and increase the focus on the cops. Those are the first steps towards being a bad movie instead of a terrible one. On a miscellaneous note, I still feel like people aren’t as scared of rats as the film series would have you believe. Sure, people find them kind of creepy and gross so they stay away, but you wouldn’t yell in terror at the mere sight of them. You certainly wouldn’t engage a few hundred of them, but you’d act with some dignity. Once they start biting you you’d run away instead of sitting down and just taking it. Honestly, the pain of getting dozens of bites in an instant should be enough to force you to move on pure instinct alone. I just don’t see a person freezing up even if it is more dramatic. At that point the fear is gone and only the pain remains. Much like when you start this film. You fear what’s going to happen and then once it plays the fear is gone and now you have to endure the terrible songs. Overall, I’d say that Ben was unfocused. It tried having way too many plot lines and incorporating a bunch of characters even though there was no reason to do so. It should have just been Ben vs the World like you’d think from the posters. We don’t need happy human subplots. Maybe if they toned down the horror aspects it would work, but you shouldn’t do both. The writing isn’t good and there is still a lot of animal violence so at the end of the day you can be sure that this film didn’t fare well for me. It’s a title that you should forget and move on from as soon as possible. 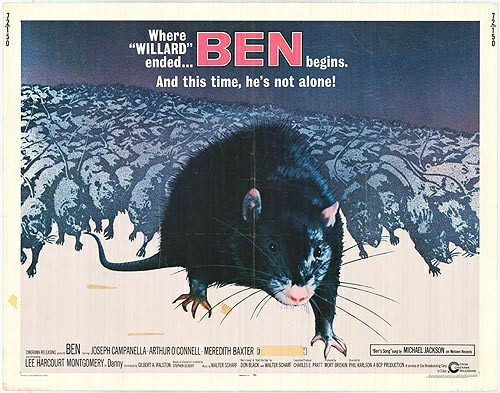 This entry was posted in Comic Reviews, Comics, Reviews and tagged Animal Violence, Ben, Film Review, Horror, Movie Review, Rats, Review, Thriller by dreager1. Bookmark the permalink.